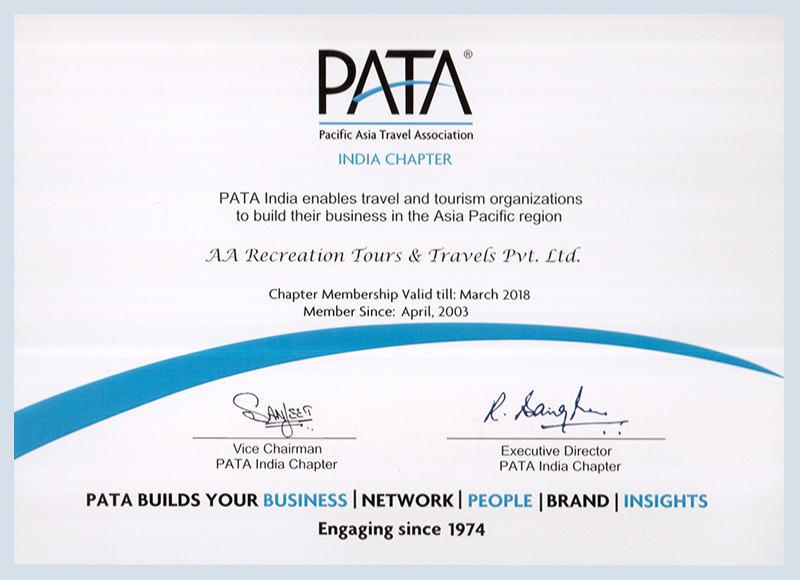 All bookings here are made with AA Recreation Tours & Travels and the booking terms mentioned herein below constitutes the entire agreement between the Client/Agent and Company. By making a booking with us and/or depositing payments with us for tour and travel services you confirm having carefully read, understood and accepted the below mentioned ‘Terms of Services’. Visitors on our website are kindly requested to fill the Enquiry Form with all necessary fields mentioned there and submit the same to be sent to our office. Upon receipt of the booking request or travel enquiry a travel expert from our office will get in touch with you with the best available information and offers for the desired tour package or travel services. In the event the travel requirements are not clear in the booking form submitted by you to us, our team may contact you via email or phone number provided by you in the booking form. No booking is considered as ‘confirmed’ unless a tour confirmation letter is sent by us to the customer after receiving the initial advance payments in our account. It is the sole responsibility of the customer to make the balance payments at least 60 days prior to the start of the tour or as may be agreed / conveyed by our travel consultant during the course of correspondence. In the event of non-receipt of balance payment by the cut-off date, the Company will retain the right to treat the tour bookings as cancelled and the advance payment may be forfeited. Our worldwide customers can avail the benefits of our ‘100% secure’ online credit card payment gateway (Visa and MasterCard). We accept payments in US$, GBP, Euro, YEN, INR and other renowned international currencies. It is advisable and requested to our customers residing outside India to make the payments in US$, GBP, Euro, YEN or their local currency (if listed in our payment gateway). Please note that the online payments attract online bank fee/charges of 3% (it may vary case to case) and the same is payable by the credit card holder in addition to the tour payments while making the transaction. For certain credit card payments, on the instruction of the bank to ensure genuine card entry our office may ask the credit card holder to fill and sign the ‘Credit Card Payment Authorization Form’ and send the same to our office along with the identity proof (passport copies etc) and/or front copy of the credit card. It is mandatory for the customer to provide us with such details / document if demanded by our office. Credit card security code (CVV/CV2 no. mentioned on the ‘back’ of the card) is case sensitive and not to be shared by the card holder or filled in the authorization form or written in email etc. 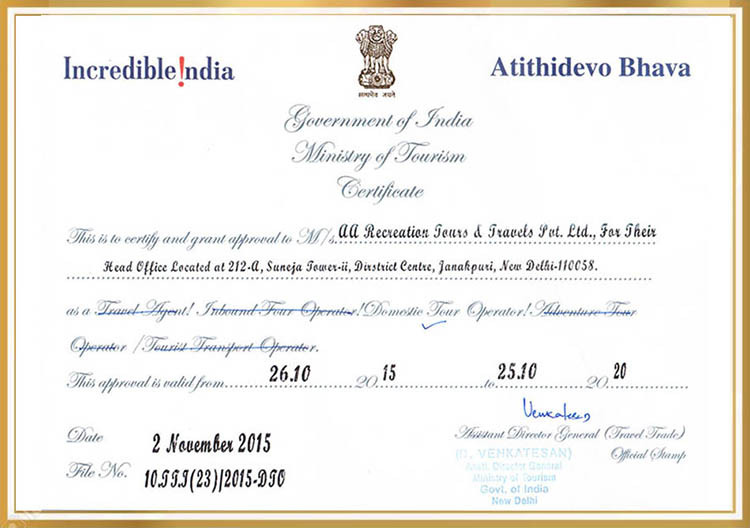 To make reservation and also for our file records our travel consultant retains the right to ask you for providing him/her with the copy of passport, personal details such as name, date of birth, gender, address, phone number, email etc., the customer is kindly requested to provide the same if and when asked. If you have any special travelling requirements (flight seats, meals, bedding configuration..), you are obliged to make us aware of these at the time of booking request. For some special tour arrangements (i.e., adventure tours in remote areas), you are requested to inform us about your latest medical test results. A fully paid insurance package is a must prior to the reservation as well. For urgent situations, our team will try our best efforts to satisfy your requirements but also the results depend on our particular suppliers’ availability. Most ‘tour packages’ offered by AA Recreation Tours & Travels are inclusive of accommodation in hotel/guest house/resorts, transportation in a private car (for private trips) or in a coach/bus (for group tours), breakfast, services of local tour guides (where available) for visiting historic sites and basic entertainments for the trip. The same may vary on case to case basis and is conveyed to the customer by our travel consultants during the course of correspondence. Our ‘independent tours’ includes accommodation in handpicked hotels selected by us based on the market report and/or recommendation of our past travelers. Based on the demand of the customer and type of requirements or budget mentioned by them, our travel consultants ensure to provide a comfortable and clean hotel for stay (for independent trip) during the trip. Also for our guaranteed departure we have a select list of handpicked hotels and guest houses which may also be changed if situation demands. In the event of non-availability of hotels listed by us in our offer, our team retains the right to reserve another similar standard hotel for the travelers. All our hotels are subject to availability. We request the travelers to check on the internet about the standard of the hotels offered by us, before making the deposit for the trip. We provide comfortable vehicle (bus/coach/car/jeep) in good condition with customer friendly English speaking drivers (basic knowledge of English). Some of our tourist drivers are highly recommended by the travelers and they are serving to international itinerants for many years now. Most trips are inclusive of assisted airport/railway station transfers. For sightseeing trips, we use only Govt of India licensed ‘Tourist Guides/Escorts’. Most of our tour packages are inclusive of services of local English speaking tour guides at historic sites. Other than English we also have tourist guides who are expert in more international languages such as Chinese, French, German, Italian, Japanese, Korean, Russian, Spanish, Turkish etc. Many of our tour packages also includes basic entertainments and activities such as traditional rickshaw rides, caprisoned Elephant ride, Camel ride, Boat tickets, cultural events etc. Please check with our travel consultant about this while making reservation with us. A list of some important ‘not to be missed’ visits/rides etc can be viewed in ‘Unique Travel Experience’ section and can be included in the trip on demand, at an additional cost. As per the common practice of the trade AA Recreation Tours & Travels operates tours on fluid price basis. The offers are subject to the limitations imposed by hotels, airlines and other service providers and the same may change without prior notice in case of hike in the air ticket price, tax structure, major fluctuation in currency exchange rate or any other reason. AA Recreation Tours & Travels retains the right to change its price and offers without prior notice, if the case occurs. It may also cause different price charged to different clients travelling in the same group/period. It is totally at the discretion of the Company to decide upon the same. 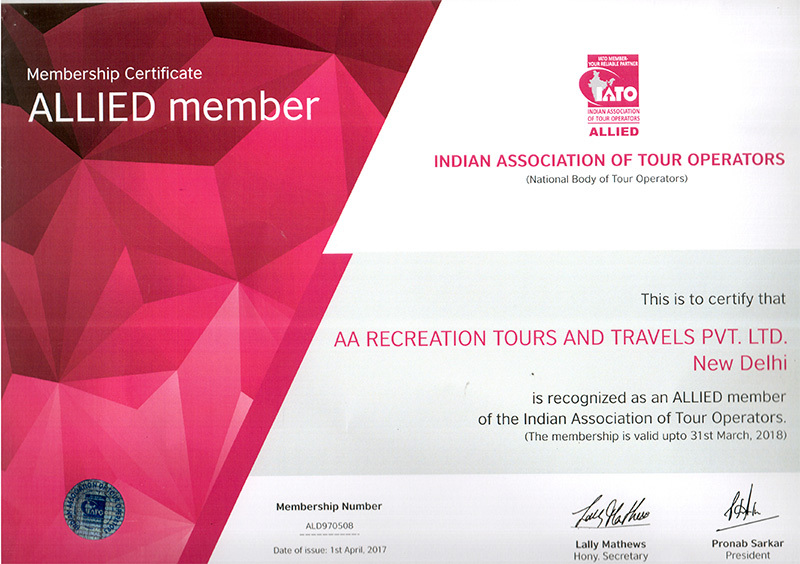 Once you have booked and paid for the tour our operation team will issue and provide you with a copy of travel documents for your trip. You are kindly requested to check the details mentioned in the travel documents and in case of any error found the same may please be reported to the our concerned travel consultant for further corrections. The original travel documents shall be sent to the traveler at the port of his/her arrival in India. The travel document kit also carries a Feedback Form with an envelope which may please be filled by the traveler and sent to our senior management for their reference and our office records. All our tours are subject to availability and our price/deals are subject to change without prior notice. We retain the right to cancel/amend or withdraw any price/deal/offer without assigning prior notice. Our tours are based on minimum participants on each trip. In the event of non fulfilment of minimum participants for the group, we shall guarantee the trip with minimum possible supplement cost which will be announced to the traveler before the commencement of the trip. At any given time if the client engage himself/herself/themselves in illegal or undesirable behavior, do not comply with the reasonable instructions and policy of our trip and services or if he/she/they jeopardize the safety of other clients, guides, drivers etc. they may be excluded from the trip immediately at our discretion and will be entitled for possible refund of the unutilized services, subject to the policy and decision of airline, hotels etc. The refund will not be immediate but will be done as per the policy of the Company through reliable banking channels only. 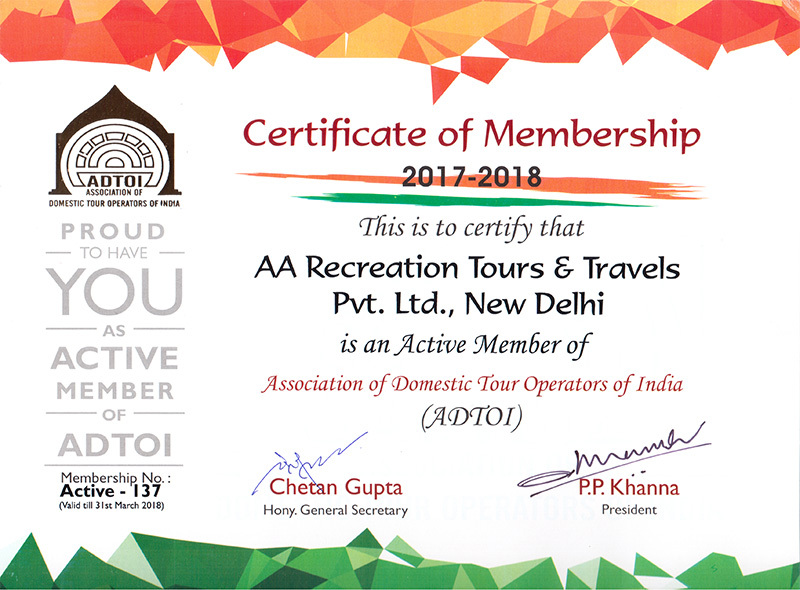 AA Recreation Tours & Travels, its staff, management, partners or representative do not bear the responsibility or liability of making refund for any unutilized service/s. It is to be noted seriously that after the start of the trip no refund is possible for whatsoever reason. 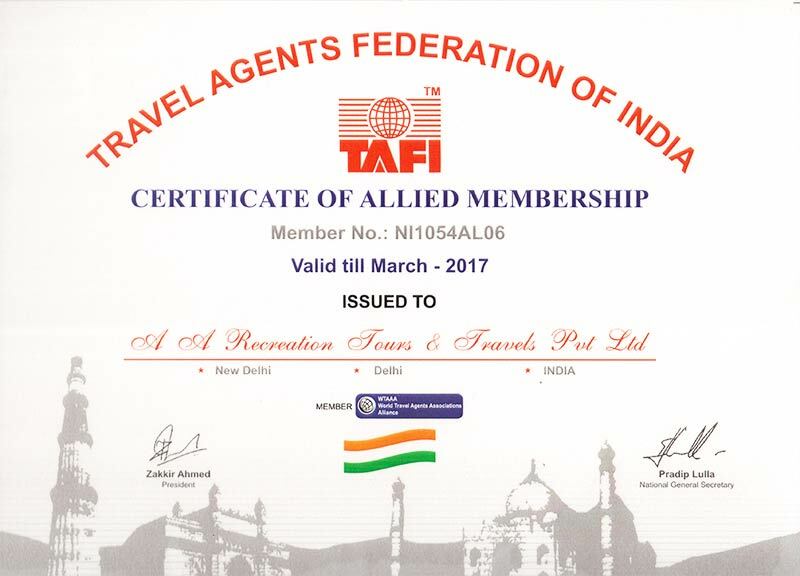 In the event of agreement by any airline, hotel etc for refund against any unutilized part of the service or item etc AA Recreation Tours & Travels shall take up the matter on the behalf of the customer and shall only offer its assistance to the customer in receiving the same from the other party. Such refunds shall be sent only to the bank account of the customer within 2-3 weeks after receiving the same from service provider/s. None of the two (or more) schemes / offers / deals (including loyalty discount, last minute discount, early bird discount etc) can be clubbed with each other or any other offer. All such schemes and offers introduced by us are only promotional offers and the terms of the scheme/s can be changed anytime thereafter without assigning any notice. We also retain the right to withdraw or modify the offers/scheme anytime without notice. 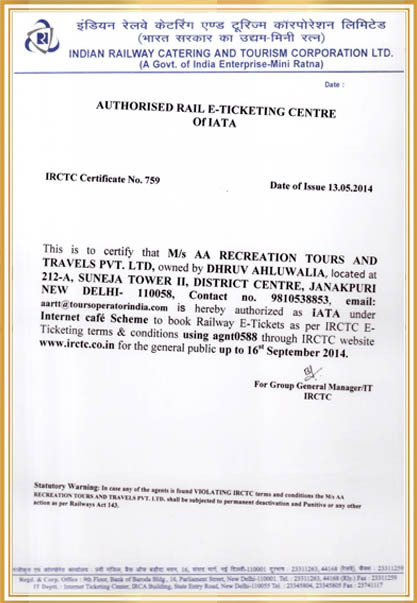 It is totally at our discretion to confirm or reject your booking under such schemes. These offers and schemes are not applicable for travel during New Year or Christmas period, peak tourist season dates, festival dates, luxury train bookings etc. No discount or offer will be applicable for the trips already booked with us under a normal price. The discounts does not apply to air fares, train bookings, luxury train travels, permits, visa, travel insurance, monument/museum tickets, extra meals and/or pre/post tour arrangements. It applies to the bonafide customer only and not to other traveler on the same trip (unless they also hold the discount ticket). While making the query with us, you clearly need to mention the details of our special offer under which you wish to book the trip. Services and bookings for all schemes and offers are subject to availability only. II) Refund of amount will initiate after deducting the applicable cancellation Charges and service charge and both will be settled within 7 to 30 days of the day of cancellation request approved by AA Recreation Tours & Travels. 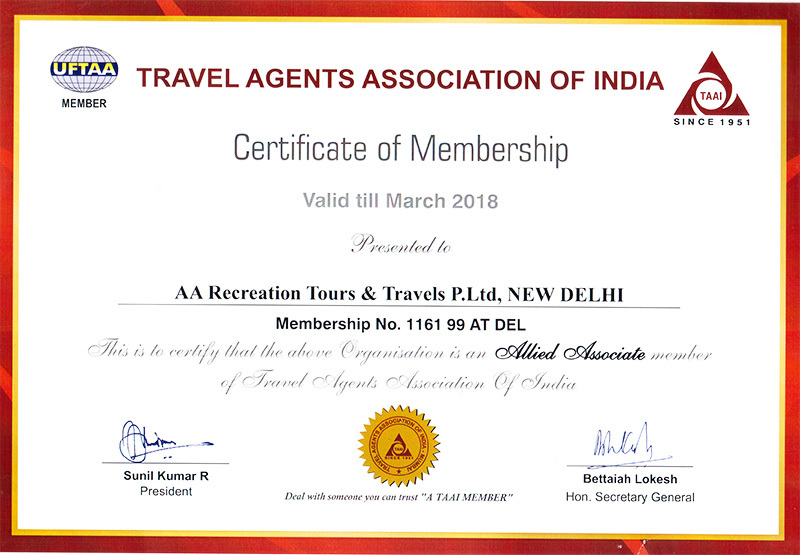 III) Booking which is under no Cancellation / No Refund, guest/client travelling or person/entity booked will have to pay the service charge to AA Recreation Tours & Travels. All disputes, claims and litigation regarding the Services shall first be settled by way of negotiation and mutual understanding. 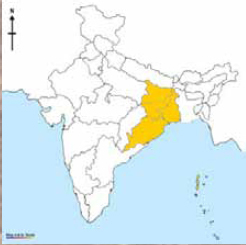 In the event such negotiation and mutual understanding would fail, the disputes, claim or litigation shall be finally settled under the jurisdiction of Delhi Courts. All claims must be submitted in writing within 30 days after the end of the Services.